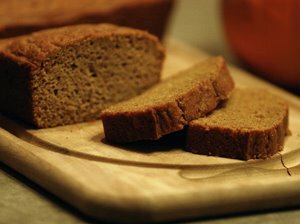 This pumpkin loaf recipe uses less than half the normally called for sweetener in other loaves, but remains quite sweet to the taste. Thus, it will be a great snack bread to have around for all of your Thanksgiving house guests. The ingredients have already been adjusted the for baking at 8000ft. You’ll need 1 pie pumpkin (ideally left over from the Pumpkin Patch Festival or there may still be some available at Colorado Grown🙂 This will likely create enough puree to make two or three loaves or pies. 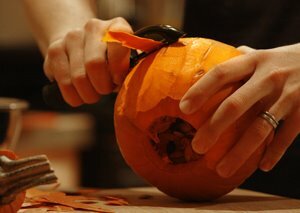 Gut and peel the pumpkin. Cut into large chunks. Steam for 10 to 15 minutes, use a fork to test for softness. Place in a bowl and smash with a potato masher. Finally, place in a blender and puree until smooth. Preheat oven to 350˚. Lightly grease a loaf pan. Combine all dry ingredients except the turbinado in a medium bowl and whisk together. In a larger bowl, whisk together the eggs, turbinado, agave, canola oil, yogurt, and pumpkin puree. Add the dry ingredients and mix until just moistened. Pour batter into prepared pan. Bake for 50-60 minutes.